Shop at Easy Comforts and enjoy $7.99 savings on orders $39+. Click here for code. Shop at Easy Comforts and enjoy free shipping on orders $45+. Click here for code. 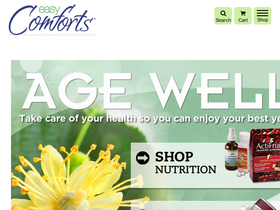 Shop at Easy Comforts and enjoy free shipping on orders $40+. Click here for code. Shop at Easy Comforts and enjoy free shipping on orders $39+. Click here to shop. Shop at Easy Comforts and enjoy exclusive promos with email sign up. Click here to shop.